Nine months post launch, Vistara, known for its premium pricing and as the first full service airline to offer ‘premium economy’, seems to have returned to the drawing board, unable to draw crowds and passenger loads. Vistara’s first flight took to the skies on January 9 on the Delhi-Mumbai airway, one of the busiest air routes in India. As a part of tweaking its marketing strategies, Vistara airlines has released its first television and print advertisement ‘Fly the New Feeling’ featuring the newly appointed brand ambassador Deepika Padukone. Conceptualized and executed by Mullen Lintas, the television advert showcases Deepika Padukone experiencing flying the Vistara and rekindling her childhood memories and her love for flying with a hummable background score in the soothing voice of a child – very international. We quite love the idea of using a little girl’s visuals interspersed with the actual narrative to take it back in time. Lintas uses nostalgia as the device to drive the ad film and it manages to charm us there! Deepika and the little one in baby pinks only add to the child-like charm of the film. The minimalist execution of the ad is sure to appeal to its target group of elite, frequent flyers, however, the concept of “new feeling” the brand promises seems amiss. Especially when the core target group is corporates, the ad would have done better had it also had some business-like attributes and not just left-it at the child-like charm. The integrated campaign was deployed across multiple platforms including print. The TV commercial isn’t as much a miss as compared to the print ad that was released in the Hindustan Times and other prime time dailies as a gatefold on August, the 22nd – the print campaign was a total spoiler. The print ad can hardly stand on its own without the TV advert – it’s shabbily done and isn’t really adept to communicate the same as the ad and really forces you to think. 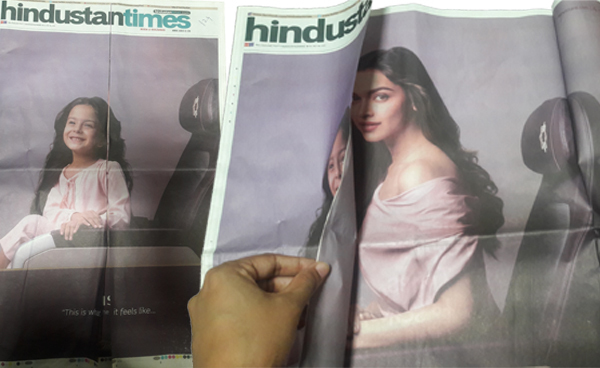 We lifted the flap only to find Deepika seated inside and couldn’t really establish the connection between ‘flying the new feeling’, the little girl and Deepika until we actually got our hands on the commercial. The print execution surely could have been ideated better. Go ahead and take a look at some of these other good and advertising campaigns of 2016. Milked to Death: Why Amul Needs Rebranding?